" … they gave us the key and we went to see it, Távora, Domingos and myself. We were three sitting at the fountain near the entrance, silently. And now? From belvedere the view was fantastic. Behind, fast roads and open field between them, for a future campus. Strange campus that we did want to set freefrom, facing the river and the sea. 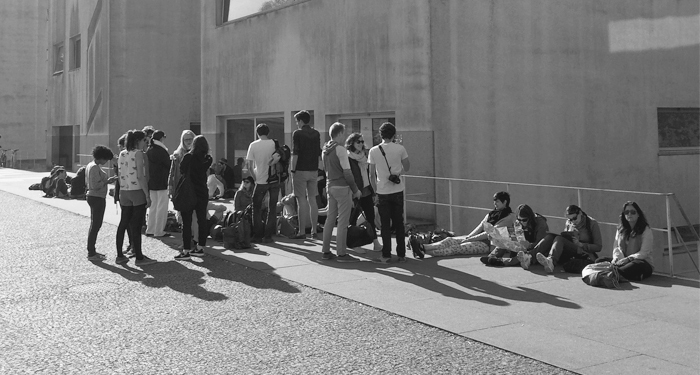 We bought the household content, some furniture, and we save the plants and the trees of the garden…"
The Faculty of Architecture - University of Porto (FAUP) provides a service of regular guided tours to the building designed by Álvaro Siza and built between 1985 and 1993. The guided walking tour of FAUP lasts approximately one hour and is led by a current student.